To ensure stability and durability of our windows and doors Russell Timber Technology sources its timber materials with care and consideration for both the Environment and EU & UK regulations. Natural timbers are engineered through modern technology to improve the end product to the client whilst ensuring optimum use of the globe’s scarce resources. All timbers used within our product ranges are subject to our strict third party accredited Chain of Custody procedures and certification. Customers can be assured that Russell Timber Technology only source the most sustainable of materials complying with legal requirements of both producer countries and UK standards achieving full Chain of Custody throughout its product ranges. Our highly engineered components are manufactured from laminated Redwoods and Hardwoods selected and bonded to exclude knots or defects yet to include straight grain ensuring better performance from your window or door despite the vagaries of our climate. This multi-layer construction offers stability and stress performance far in excess of traditional solid timbers. 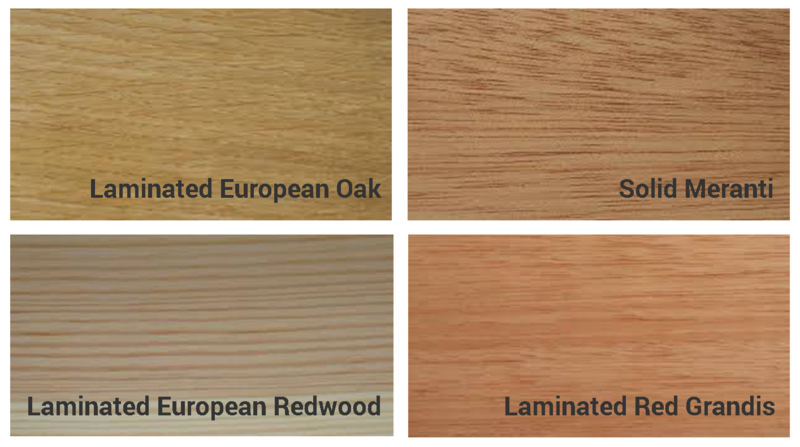 Products can also be manufactured from laminated and solid European Oak which is more stable and durable than American Oak in external locations. Likewise products can be manufactured from laminated and solid Hardwoods all from FSC accredited sources. These exclusive materials offer a classic finish for quality windows and doors giving superior appearance and performance. To enhance these beautiful timber products all windows and doors are fully factory finished with micro-porous paints to reduce maintenance and retain their natural good looks. Longevity can be further improved by cladding their external face in aluminium – aluminium cills being an option for timber only products. Alu-cladding is available on most our product ranges including our Designer Oak range. Our complete range uses timber from managed forests with Full Chain of Custody. Timber is the only building material with a positive impact on the environment. So it is vitally important that we manage our forests for future generations.